This dinnerware set is absolutely beautiful. I also purchased multiple serving pieces and am pleased with all items. The colors, design, and quality are superb. 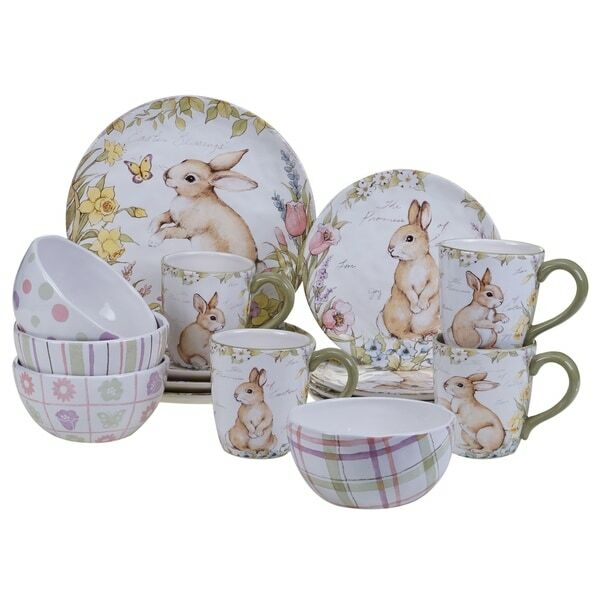 The mugs are a nice size and match the salad plates with 4 different bunny designs. The bowls are cute with 4 different but coordinating designs and the dinner plates are identical and coordinate with everything. Lovely collection for Easter, Spring even into Summer. The dinnerware set is beautiful, I am sure I will enjoy using it. This was my first purchase with Overstock and I must say that the service was great. My order arrived on the promised date in perfect condition. I must commend you for your detail to packaging, I was very impressed. Exactly what I was looking for. I ordered 3 sets and not 1 piece was broken. I've been looking for Easter dishes for a couple of years and these are perfect! So cute and my husband loves the size of the bowls and mugs. They make you smile every time you use them. Love these dishes. They are the exact dishes for Easter. I am very pleased and would recommend them to any one wanting a festive Easter dinner table. Loved the Easter Dinnerware. It was more than I expected!!!! I wanted Easter dishes and these are perfect! I love Susan Winget (artist) and the quality of Certifed International.